Win Conditions: To win our prize you should be on the top of ObjectScript Leaderboard and upload all the solutions in a public repository and present the code in InterSystems ObjectScript in UDL form. The example of the repo. Note: Don't forget to use our own InterSystems Leaderboard, with the code 130669-ab1f69bf or the direct link. I'd like to receive an invite to join Global Masters. What I have seen happen a few times allready is that people from our leaderboard just copy the solution from another person in another language and submit the results without having done any coding at all. He did the second part in 13 seconds while the fastest person on the leaderboard took 3 minutes and half to do it. The second solution took quite a bit of programming and the 100th player to finish star 2 needed allmost 10 minutes. Someone on our leaderboard: 13 seconds. This means he just copied a solution from another player, put in answer 1, after that was accepted he inserted answer 2 and submitted again. Clearly because a big price is involved people resort to playing unfairly. - Let all people post their public repository on here and after each star rerquire them to push their solution to that repository. This doesnt stop people from copying from other players in our competition but at least forces people to use Caché. Blantant copying will still be spotted because the code will resemble another competitors code. Also this will make it so that a copying person cant win the day anymore cause he will have to wait for at least one other caché player before he can start copying. Maybe we should even start the competition from the day where we are working on the new way. Changing the rules during a competition is a very bad idea. Participating in a game includes accepting the published and know rules. Accept it or run a different game. Even my grand-children starting from 5 understand this. I think you are right twice. First, no one can stop cheating in the world and the second no one can win this contest with cheating. And of course no one can stop copy-n-paste in coding :) On the other hand, there is a chance to know something new even with copy-pasting. As a community manager, I would love to see more open repositories with ObjectScript and I like what we had last year - the open discussion of Advent of Code problems solved with ObjectScript. Thanks for sharing your repo! Speaking about the prize it's clear that it can be interesting only to people who develop with InterSystems Data Platforms and I believe this is the key motivation to win. As we see it now the competition is active and healthy, we don't plan to change any rules but encourage the fair play. Submitted code is not public by default. Players get different inputs for puzzles. All timings are calculated from the moment the puzzle is published, not the moment you start working on it. Assuming fastest coder would publish the code, finding it and rewriting it is going to take time. Moreover fastest solutions usually use, let's say, advanced language-specific concepts, so starting from scratch could often go even faster. I'd be curious where you get the data points from, I haven't been able to see other people's times. Also keep in mind, sometimes the way you do a solution is a maker/breaker on how quickly you get the second part. Day10 was another great example for that. I am not accusing you of anything Fabian, on the contrary your results seem to show you are creating solutions yourself. ah! I hadn't found the json api, that's neat. Thanks for pointing me towards that! I would also be very cautious of trying to make judgements based on the way people implemented things. For some of the puzzles there are very clear 'best solutions' and one would expect people with the necessary training in data structures/algorithms will simple go with a similar implementation because 'that's the way you solve a problem like that'. I'm sure once we get to harder problems that might change, but for these beginning problems there isn't a good way to fix this. I decided to participate too! And here is a short "Coding talks" Video on how to code Advent of Code and use Github and VSCode. I gave up for the night and finished late today. Though leaders are high, the nature of the contest lets anyone who'll join the game today to win the contest! Congratz all, it was a fun race. It was! Good Game everybody & Merry Xmas! Cool battle! Congrats, to all participants and @Fabian Haupt as a winner! 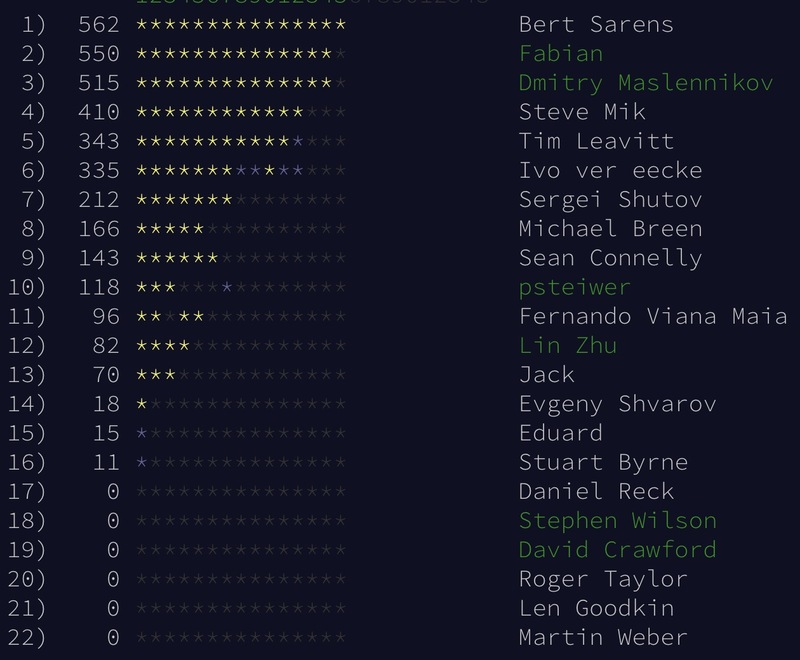 @Bert Sarens, @Fabian Haupt - you have more than 1,000 points both in ObjectScript leaderboard: why don't you listed on a general leaderboard? COS has some nice features, but most of the time it is lacking basic functionality that would make us competitive in these types of contests. On top of that, there are no libraries, so you always have to code everything from scratch. Which has a certain appeal to it, but will not not get us close to the leaderboard. The closest I got was place 137 on day22, part2. Interesting thoughts, thank you, Fab! @Bert Sarens, @Timothy Leavitt, @Dmitry Maslennikov, @Michael Breen,@Sean Connelly, @ivo Ver Eecke and others - and what are your top places by days? And your comments about ObjectScript and how could we perform better e.g. next year are very welcome too! Congratulations Fabian and Bert for completing all of the challenges. It's 5am when the challenges open up here so its hard to compete, but I think I would still be far behind some of the times that you have been achieving. Thanks Sean, very interesting! Looking forward to see your Python-to-ObjectScript transcompiler. My top place by day was 242 on day 8 (that was the only day that I actually did the puzzle at midnight though - I'm not at all a night owl). Congrats to winners and to all the participants! We'll provide all the prises shortly and would appreciate if you share your repos (a lot of participants already did). It would be great to know how people solve the same tasks with ObjectScript independently. Thanks in advance! My congrats to winners and Season Greetings to everybody! I'm just curious: why some surnames are emphasized with green in the leader board? Good joke - haha. All of them are clicable as all of them are drawn on the same jpeg file, aren't they? Some users configured with link to their GitHub account, and they shown in green, so can click, other users does not have links. If you would register there and have joined our leaderboard, you would be able to check it by yourself. But we don't see this stuff at community site. It's always funny (at least for me) when some stuff is discussed as commonly known while it really is not. They are clickable for real but on the leaderboard pages. Here is the ObjectScript leaderboard, which you can join if you register on Advent of code site with email - and you'll have normal "white" name, and "green clickable one", if you join via Github or any other applicable for Advent site OpenID provider. E.g. see the overall "world-wide" leaderboard which is available without authentication.